I read a FaceBook post from a young lady who said a close family member had “unfriended” her. As I pondered this, I was mindful, there are always two sides to every story. I wondered about the other side of the story. I don’t remember any of her posts being inappropriate, so I looked through them to see if I missed something. I had not. Not one of her posts crossed any type of ethical or moral lines. Not even borderline. What type of message did the family member intend to send to her and why? I was recently “unfriended” by a family member. When I asked about it, they indicated my FB posts were too self serving in nature and they weren’t interested in reading them. As is the nature with social media, we share our joy and happiness. We share our events, our excitement and our thoughts. Interestingly enough, also available with social media are ways to scroll past the posts you do not want to read. Similar to the old fashioned way of reading a newspaper or magazine. If you don’t want to read something… you don’t. You simply turn the page. When something on television doesn’t resonate with you, change the channel or turn it off. FaceBook has this feature where you can scroll past a person’s posts. OR you can take their posts out of your newsfeed so you don’t even see what they share. Especially if they are fanatical about politics! You can turn off notifications as well. It’s that easy. That is…IF it is truly about the content of their posts that offends you. Social media is an interesting facet of current times. People use this platform in many different ways. Some use it as their political microphone. Others use it to support and advertise their business. Many people use it as a way to follow friends and family activities yet never post their own. Just yesterday I heard two people chatting, never having met until then, indicating they felt they knew each other because of their connections on social media. For each of us, our intention to use social media may differ. There is no right or wrong way to use it (illegal, immoral, unethical uses not included). And for each of us, we have the right and free will to read what we want, scroll past what we choose not to see and seek out what we enjoy reading more about. When we disagree with another’s viewpoints, we can easily ignore their posts. Really, it’s just that easy. Even the political posts! 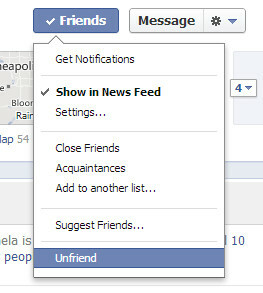 When we click on the option to “UNFRIEND” we are doing more than limiting our view of their posts/newsfeed. We are sending a message that cannot be unheard. We are making a statement TO the individual that goes far beyond social media. Explore your true intention before unfriending someone. Decide if it is really about the posts or is it something else. Wouldn’t it be wiser and more helpful to share your thoughts or concerns with the person rather than sending them a message you can never undo. Is it worth damaging a long term relationship over a social media post? And if it’s not about the social media platform, then determine what it is really about and work to resolve it. Life is too short and relationships are too precious to click that button and send the huge message that goes along with it.